Late last week, the wait was finally over with the grand opening of Iron Grate BBQ Co. (4177 S. Howell Ave., 414-455-1776). 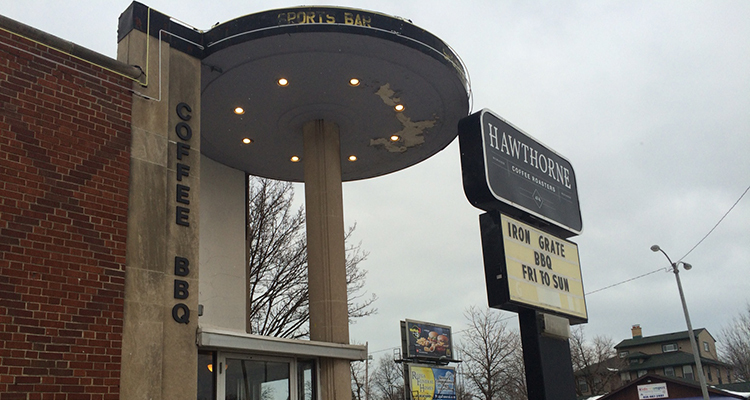 Could the coffee house-slash-weekend pork purveyor with its signature rib and trusty smoker named “Edna” finally and firmly put Milwaukee on the map alongside the likes of Memphis, Kansas City, and the Carolinas? Milwaukee Record sped southbound down Howell to the self-described “Home Of The Milwaukee Rib” to try one of the first racks Edna offered the general public. The space: Standing garishly on the corner of Howell and Plainfield avenues (kitty-corner from Bar Rescue project Campbell’s Irish Pub), the burly brick building still shows the scars of past occupants—Shiver Me Timbers and, most recently, Rodeo Bar among them—with a fading “Sports Bar” label emblazoned above the entryway. “Coffee BBQ” lettering and Hawthorne signage does its part to deflect attention and exorcise the demons of businesses past. The exterior remains a work in progress, to be sure. Fortunately, if there’s one type of cuisine that places little-to-no importance on decor and outward appearances, it’s barbecue. The interior seems a little closer to completion, as the squared-off counter, subtle backing of adult contemporary music, and burlap sacks converted into decorative tapestries serve the cafe motif well. In equal measure, the vertically hanging American flag, small cluster of wood benches destined for family style dining, and roll after roll of paper toweling said “BBQ.” As a coffee shop, it’s far from as chic as its bean-brewing brethren in nearby Bay View, but as a quaint, out-of-the-way rib place, it’s nothing short of picturesque. The service: Walking in just after the lunch rush on opening day, our path crossed with the only barista and cashier on staff, Kendra. Knowing we (like everyone else) were new customers, she patiently waited behind the counter with an overriding positive demeanor as we pondered our order. When we teetered on our decision of sides, she was happy to step in to offer her recommendation, which we took. Still, being the first day of the dual restaurant’s existence, there were some minimal and expected hiccups. Our pour-over coffee arrived after our meal, but also came with a complimentary coffee voucher for our next visit and an entirely unnecessary apology from the woman simultaneously juggling coffee-making and counter duty in alternating waves. Milwaukee Record‘s food: In addition to our delightfully strong pour over coffee ($2.50), we opted to keep our first visit simple by ordering the “Meat & 3 Sides” specialty combo ($15). Iron Grate offers beef brisket, pulled pork, and hot links, but we felt we’d be remiss if we left the property without some of those trademark Milwaukee ribs in our body cavity. As for our three sides, we kept things standard with baked beans, smoked tomato mac ‘n cheese, and smothered greens. All “Meat & 3” orders also come with a piece of white bread and pickles. “2 Meat & 3” and “3 Meat & 3” combos are also available for $23 and $30, respectively. We’ll just bypass the blah room temperature macaroni with nary a tomato to be seen and the “Texas toast” that was a piece of plain bread that was neither buttered nor toasted to, instead, focus on the ribs. Though just three short ribs came out on our lunch room tray, the belly-on cut made the holy trinity thick enough to have the meaty output of five or six traditional ribs. The only sauce to be seen was a rub, which was smokey with a hint of vinegar and an added kick of black pepper. Admittedly, the presence of pork belly made the ribs stringy and tough to eat at times, but they were worth every greasy napkin piled on our tray by meal’s end. While the mac ‘n cheese and, uh, dry slice of white bread left something to be desired, the fresh homemade baked beans and sweet pickle medallions, along with the tangy, succulent greens came together to take our rib platter to the next level. We actually combined the remaining juice of our greens with the basic noodles to somewhat salvage them. Best yet, the stone ground grits—which a familiar acquaintance we’d happened upon insisted we try, saying they were “better than grits [she’s] had in Atlanta”—were creamy, cheesy, and bordering on incredible. Even if we’re not hankering for ribs anytime soon, a trip for southern sides to-go ($5/pint, $9 quart) could be in our near future. The verdict: First day missteps and so-so sides not withstanding, it’s safe to say an experienced local coffee roaster and an ambitious sous chef have come together to forge a partnership that’s as atypical as it is encouraging. There’s no telling whether Edna’s weekend output in the unassuming husk of a south side sports bar will one day help a region so definitively unheralded and lacking in rib reputation to develop a true “Milwaukee Rib” variant. But bless Iron Grate BBQ Co. for trying. FeatureFirst ImpressionIron Grate BBQ Co.